Today, I’ve come to accept that I’m a quiet person. My personality derives from my relatively friendless and bookish childhood (thanks, Mom and Dad, for introducing me to Harry Potter). Whenever someone genuinely wants to befriend me, my heart still beats embarrassingly rapidly. But at such a liberal institution as UC Berkeley, I frequently wondered if my quiet demeanor arose from my internalization of racist expectations towards Asian women to be passive. It was a heavy accusation against myself, and it frustrated me. As a humanities student, I cared deeply about critical theory and literature. Yet I always felt self-conscious — very viscerally so — about being an Asian female in a humanities classroom. Rarely did I have classes taught by Asian women, let alone come across them in my syllabuses. In my smaller classes, it was rare to see Asian female students at all. This harrowing absence made me question if I truly belonged in these venerable classrooms and if my love for the humanities was at all valid. I believed that it made me scared to speak up. And my shame devoured me. Doubt and anxiety followed me for three years. In class, I was mostly quiet, but pushed hard against my quietness because I didn’t want to be perceived as passive. I nervously bullshitted points about Marx or Derrida, never speaking with the precise, effortless panache of my imagined ideal of a literature student. I fell into an unproductive staring contest against self-limitation and self-pity. But something clicked at the end of my junior year. I took a Southeast Asian studies literature class on voice. I read everything from a novel about a 7-year-old girl experiencing the horrors of the Khmer Rouge to a short story about a Vietnamese Australian master of fine arts student who rejected and desired his father’s affection. I came to understand the self as a construct of projections by others, and despite this pressure to maintain a self, a person could still defy these imposed projections. Unchaining myself from myself, I felt my excitement to live life to the fullest finally supersede my anxiety about self-presentation. I undertook a thesis about a topic in which I was emotionally invested rather than one that would make me seem learned. I started working at a cultural center, where I discovered my love for design and publishing. And most importantly, I rejoined The Daily Californian as an arts writer, which reaffirmed my love for writing. In forgoing the idea of a socially presentable self, I ironically became the best version of myself. Senior year has been the most generative year of my life, full of passion and love. I did what I loved to do — to read and write and appreciate art. If you told me a year ago that I could push through my anxiety to write a 50-page paper, I wouldn’t believe you. If you told me I would direct two community publications, I would laugh at you. If you told me that I would muster the courage to interview people and write a long-form piece, I would be very doubtful. And I am still pretty quiet and awkward. In letting go of the idea of a presentable self, though, I also allowed myself to be vulnerable to others. And in doing so, I realized that my accomplishments were never truly my own. For me, creative work necessitates forgoing ego to create cool stuff with cool people. My projects were insignificant compared to the people that I met along the way. Writing my thesis, I learned from a fastidiously dressed man who wears cerulean blue Calvin Klein glasses and whose office smells like Moe’s Books. He asks me intellectually rigorous questions and reminds me that my emotions have a valid place in academia and in the world at large. At work, I feel like the waifish Amelie Poulain at Cafe des Deux Moulins, accepted by a group of warm-hearted people who are incredibly patient with my shyness and believe in me. And, at the Daily Cal, I work with zany editors and writers who light up my social media feeds with sultry Pepe the Frog memes and Kanye West thinkpieces. The arts department collectively calls itself “arts trash,” but truthfully speaking, is full of gems who are good-humored and incessantly inspiring. As intense as Berkeley has been, it has also been so generous in lessons and opportunities. Brimming with postgrad panic, senior year has so far been the most stressful and confusing year of my life. Yet it has also been the year where I found — and let go of — myself. 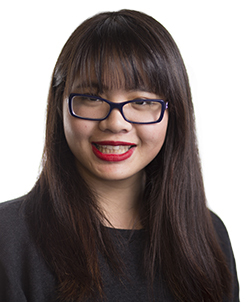 Stacey Nguyen joined the Daily Cal in spring 2014 as an opinion blogger before being a Weekender reporter and Arts and Entertainment reporter. She is graduating with bachelor’s degrees in Rhetoric and Political Science.